NBC calls Ohio for Obama. CNN calls it too at 9:34 pm. In addition to the national polls cited here by Big Tent Democrat, there's a Suffolk Ohio and Missouri poll out today. Barack Obama leads John McCain by 9 in Ohio and McCain's ahead by 1 in Missouri. I think Ohio is critical. If McCain loses there, I think he loses the election. Joe the Plumber didn't help McCain in Ohio, his home state. Obama outspent Hillary 2 to 1 on ads. In the high-profile Ohio presidential primary campaign, the campaigns of the two Democratic candidates for president aired over 16,000 spots, spending approximately $6.8 million. Obama outspent Clinton by a margin of nearly two-to-one, with the Illinois Senator spending over $4.4 million to air just over 10,000 spots. Clinton spent $2.3 million and aired just over six thousand spots. Republicans were largely absent in Ohio; neither John McCain nor Mike Huckabee aired a single ad leading up to the Ohio primary. I wrote so many posts last week like this one about Ohio and the rural vote, both from a historical perspective and for this year. I feel vindicated -- here's a new AP article today that explains how well Hillary did in the Ohio rural vote, how it was her intentional strategy, how John Kerry failed to go after it or win it, and more. Bottom line: The Dems can take Ohio in November. But not without that rural vote, which went astonishingly for Hillary. Decades have passed since Ohio last saw a competitive Democratic primary, and the interest showed in a record turnout of 48 percent of registered voters. Clinton still garnered more interest than Kerry in his primary four years ago. Where she won 81 percent of the vote in Scioto County, Kerry got 55 percent in his 2004 primary. Where she got 80 percent of the vote in Jackson County, Kerry got 64 percent. Where Clinton got 78 percent of the vote in Lawrence County, Kerry got 59 percent. CNN projects Ohio for Hillary! Hillary's on her way to speak to supporters, the networks will cover it. Update: Live blogging her victory speech: Hillary is jubilant. She looks fabulous in red. The song playing: Bruce Springsteen's "The Rising." She's smiling from ear to ear. "As Ohio goes, so does the nation." "This nations coming back and so is this campaign." "No one has won the White House in recent memory without winning the Ohio primary." She lists all the states she has won. "Americans don't deserve more speeches, they deserve solutions and they deserve them now." Hillary is getting voters without college degrees. College educated voters are going to Obama. That's all they reported so far. CNN's Ohio results page is here. MSNBC's Ohio results page is here. Buckeye State Blog is tracking the orders. I agree that this could result in lower voter turnout which would hurt Hillary who is favored in Southeast Ohio. (Bill Clinton carried these counties in the 1992 and 1996 general election, which resulted in his winning Ohio, while Gore and Kerry did not and lost Ohio in the general election. Obama could be adversely affected by such an order in Athens county, home to Ohio University and it's tens of thousands of students. Hopefully the candidates' ground operations are prepared for this and have volunteers with vehicles to get people to the polls. The Cleveland Plain Dealer reports lots of Republicans are voting in the Democratic primary. Why All the Focus on Republican Texas? As between Ohio and Texas, it seems to me the media is concentrating too much on Texas, which is all but certain to go Republican in November. By contrast, as I've written several times this week, and as at least the Minneapolis Star Tribune is now reporting, Ohio could go either way in November. [Texas] will likely be largely ignored by the eventual nominees this fall even as Ohio is avidly courted. It has become so completely Republican that no Democrat has been elected to a statewide office in the past 14 years. 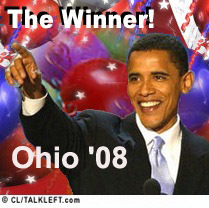 No Republican has been elected President without winning Ohio since Abe Lincoln. The only Democrats in the past century to become President without winning Ohio were FDR and JFK. 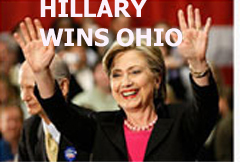 Which Democratic nominee in recent history won Ohio? Bill Clinton -- twice. Why? Because unlike Al Gore and John Kerry, he won southeastern Ohio. Gore and Kerry won big in Northern Ohio but lost the state to Bush. As for what to watch for in Ohio, this should get you started. A Cleveland Plain Dealer poll conducted by Mason Dixon of registered Democratic voters who plan to vote in the primary, has Hillary Clinton ahead of Barack Obama, 47% to 43%, with 90% of voters decided on their choice. (Actual poll results are here (pdf.) The margin of error is 4%. There are some geographic and issues differences that may be worth noting. Voters surveyed said they see little difference between the candidates' positions on the North American Free Trade Agreement, which many Democratic voters blame for the loss of jobs in Ohio and which has been a central theme of both campaigns. The Plain Dealer poll shows that Clinton's biggest lead is among voters in southeast Ohio, a poor region of the state whose voters supported Bill Clinton in 1992 and 1996. She leads Obama there, 55 percent to 32 percent; Obama's biggest lead is in the southwest, where he is up 52 percent to 36 percent.